You can never have enough shelves in the nursery! 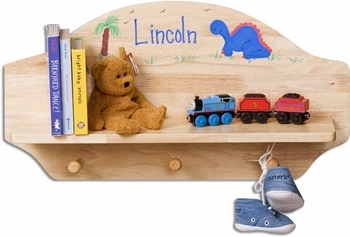 This quality all wood shelf also provides the added value of three useful hanging pegs and comes personalized with the baby's name hand painted with your choice of cute artwork! Available in natural wood finish as shown, painted satin white or dark espresso. It's a wonderful focal point in child's room, perfect for displaying favorite toys or books. Some assembly required. Dimensions are 12 inches high by 24 inches wide by 6 inches deep. Sample shows our Dinosaur design. All Paint is Certified Lead Free! See More Images to see this beautiful gift in the white and espresso finishes.